Goverlan helps organizations provision users quickly, cheaply, reliably, and securely. Goverlan integrates with Active Directory and includes a powerful tool-set and script deployment engine. By leveraging Goverlan Scope Actions you can combine a sequentially-executed series of actions to automate new user provisioning and run it against one user or a group of users with a single mouse-click. This is just the beginning, Goverlan will help you automate and ease management throughout the user life-cycle process. 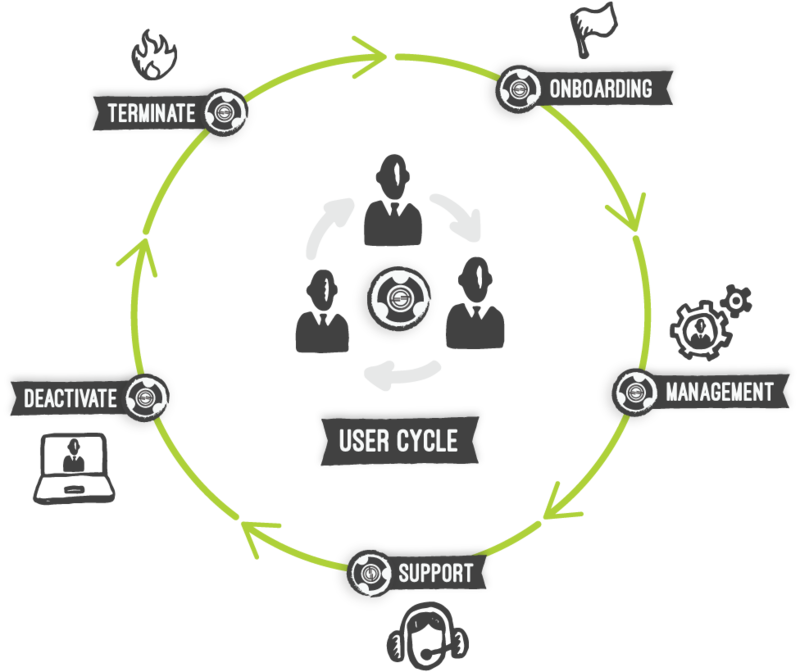 Goverlan can help you manage users throughout the user life-cycle processes. Take a quick look below and see examples of how we on-board new users, manage and support your entire organization, and finally terminate employees at the end of the process. Users are dynamic—they change location, job role, responsibilities, access level, and more. Your systems and application must reflect these changes. Managing users with native tools is cumbersome and repetitive, Goverlan can make user management easy with quick access to the AD attributes you use the most. Import/export user group memberships and understand user access quickly with a great view on recursive permission (shown below). Save templates that will allow for quick or automated manipulation of any user attribute. Users experience problems! Password resets/locked accounts, security entitlements, software/application deployments, patching, printer and drive mappings, hardware failures, performance issues, and more all get in the way of user productivity. Goverlan includes a powerful and comprehensive set of support tools so you can keep users productive. Administration & Diagnostics—Support users behind-the-scenes with diagnostics, control and reporting on users, workstations, and server without every starting a remote control session! Remote Control—Advanced remote control for Windows, Mac, and Linux machines. Now includes remote shadowing for Citrix user sessions. Users have a finite lifespan. When users leave, whether through termination, resignation, end of contract, end of relationship, retirement, or other – their access to systems and applications needs to be revoked. User termination can be a “hair on fire” moment. At 4:45 PM on a Friday you may get that call that “Joe” is being shown the door and HR needs a complete set of reports on activities leading up to his dismissal. Avoid an embarrassing or stressful weekend (or weekday) with Goverlan. Create employee termination templates in advance! Goverlan allows you to build these Action templates according to your preferences and organizational mandates. Don’t get caught off guard the next time, have a customized Goverlan template ready to go! Goverlan touches every part of the user provisioning life-cycle allowing administrators the access and automation they need to keep themselves and the teams they support productive.